The comprehensive guide for identifying needs, specification and installation of emergency and security lighting systems. 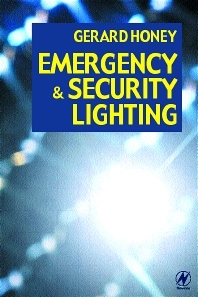 Emergency and Security Lighting is a thoroughly practical guide for lighting installers and electricians, intruder alarm and fire alarm installers, and managers with security and health and safety responsibilities. Covering the latest workplace directives, building and fire regulations, it is essential reading. The text is concise and accessible and includes the latest technical developments such as low-energy systems for extended period lighting. This book provides the underpinning knowledge necessary for the level 3 NVQs from SITO / City & Guilds. The concise, accessible text makes it an ideal coursebook. This accessibility also makes it ideal for hard-pressed practitioners. Gerard Honey is a practising security installer working in the UK and Spain. He is author of a number of security books and a regular contributor to magazines including Security Installer and PSI. Alarm installers, electricians (lighting installation), fire alarm system installers, health and safety managers, security managers, architects. Preface. Acknowledgements. Part 1 Emergency Lighting Systems: Introduction; System selection; Design considerations; Self-contained systems; Central battery systems; Wiring systems; Batteries and data; Low mounted way guidance systems and ancillary applications; Automatic intelligent testing; Reference information. Part 2 Security Lighting Systems: Architecture; Selection of lighting system; Luminaires and light forms; Detection techniques; Demand lighting; Extended period lighting; CCTV and observation lighting; Energy management; Integrated systems and central monitoring; Reference information. Index.